A review by Teen Blogger, Malk. Everyone knows the story of Cinderella. At this point, I have read so many versions of it that I had a tough time just picking up the book the first time I saw it. Yet, the further I read, the more I was delighted. This book was sweet, well-written and very enjoyable. 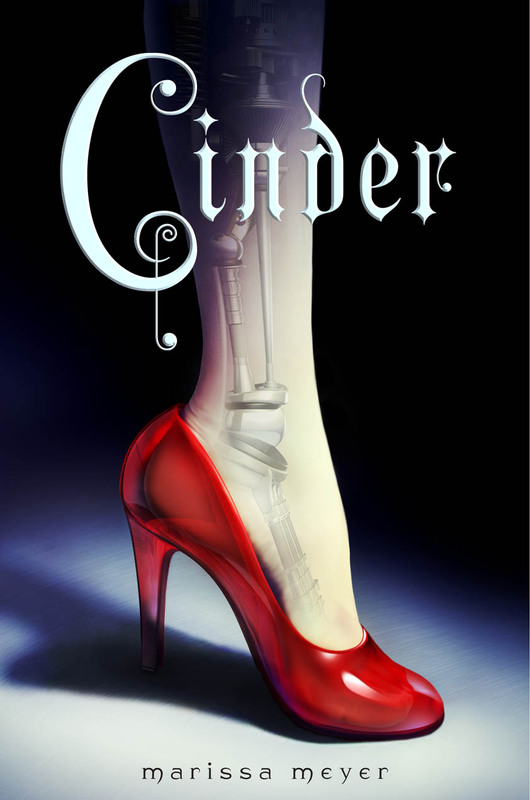 Cinder is a retelling of Cinderella, which takes place in the future. It is a New York Times bestselling book written by amazing Young Adult author Marissa Meyer, who also wrote Renegades, Heartless, Wires and Nerve and the rest of the Lunar Chronicles Series. The first book of The Lunar Chronicles series stars Cinder, a gifted mechanic, who is a 16-year-old cyborg. She lives with an evil stepmother, one horrible stepsister (Pearl) and one great stepsister (Peony), along with her best friend, an android. Sounds kinda like the normal Cinderella story, huh? Except IT’S NOT!!! In this story, life isn't all cleaning and singing like a typical Cinderella tale. There's a deadly plague, poverty, and cyborg sacrifice. There is prejudice against the cyborgs, and the fact that they are living on borrowed time and owe their lives to society if need be. Because the plague can strike anyone at any time, cyborgs are drafted at a rate of one per day to be sacrificed for plague research, because they are no longer considered human, therefore, their lives do not "matter." That is just plain cruel, because cyborgs are/were humans once upon a time! Some poor guy lost his foot and got a replacement? Disgusting creature. Sacrifice him. A rich dude had his arm cut off and got it replaced by metal and wires? Monster. He deserves to die. Sacrifice him. a small piece of partly burned coal or wood that has stopped giving off flames but still has combustible matter in it. Cinder was burned in a fire (which made her need cyborg surgery) at a very young age. What do we name her? Cinder. All her life, Cinder has been considered a burden by her stepmother, and a monster by most of society. Being cyborg does have its benefits, though: Cinder's computer of a brain has given her an unusual ability to fix things (robots, hovers, her own malfunctioning parts), making her the best mechanic in New Beijing. She’s a second-class citizen with a mysterious past that barely anyone knows about. When Cinder’s younger stepsister—the nice one—and only human friend, catches the deadly Plague (Letumosis) that has been taking people’s lives for over a decade, her stepmother volunteers her for Plague research, an "honor" that no one, mostly cyborgs, has ever survived. This book takes place after the fourth World War, where cyborgs, humans, and androids all crowd the streets of every city, every town, in the world. Things are very technologically advanced. There are people who have inhabited the moon and called it home, people who are referred to as Lunars. These people have and uncanny ability to manipulate, or “glamour,” humans and other fellow Lunars. A vicious yet beautiful queen named Levana threatens war on Earth day and night, and nothing will satisfy her unless the handsome prince Kai of the Commonwealth (modern-day Asia) will become her husband, her king, her prisoner. The Lunar people have been known to be heartless and evil, deceiving people into believing, feeling, and seeing things they don’t want. Levana’s beauty comes from her “glamour,” which she uses as a mask to cover her real face and body. Cyborgs are drafted and killed daily while scientists experiment on them for a cure for Letumosis, a deadly but fictional disease. A fifth World War could possibly start due to Levana not signing the peace agreements. There is still poverty everywhere, though not as much as there is now. The world is very different from what we know of today. The story is nothing like the normal story of Cinderella that we all probably know by heart. The story had many, many, many twists which just added to the excitement. It is full of adventure, as Cinder is volunteered for plague research, asked to fix a royal android, meets Prince Kai in person, starts developing a small crush on him, and finds out about her past. This book would be great for any fantasy, sci-fi or adventure lover. It is very intense and funny, and Cinder is probably the sassiest character you will ever read about. There are parts where you just want to smack some of the characters with their own book (Pearl, Adri, Levana, the townspeople, even Kai and Cinder sometimes,) and others where you just want to spoil the whole book for yourself because you can’t wait to figure out what happens. It isn’t the love story of Cinderella and Prince Charming that we all know of, and Kai doesn’t like Cinder just because of her looks, but because of her actual personality! There are three other main books, one novella, and one sequel book. Marissa Meyer also just published a graphic novel that also takes place in the Lunar Chronicles world. The second book is a retelling of Red Riding Hood, the third book is Rapunzel, and the fourth book is Snow White. There is some romance in the first book, and you see more of Cinder in the rest of the series, as well as other characters. By the end of the series (if you decide to finish it,) you will be in love with at least ten different people! If you read and loved Cinder as much as I did, there are many more books in which you will see Cinder again. So, Put the book on hold right now so you can read as soon as possible, buy it at the bookstore, borrow it from a friend, or read it if you already own it.